I went out dancing in Adam’s Morgan on Friday night, where one of the most horrifyingly awesome interactions I have ever experienced occurred. I was out with friends of friends, and one of them was apparently interested in me. Guy: I heard about your blog, so you must be a good baker? Guy: Well I know your mom must be a good baker! Guy: She is because she made you! And then my mind exploded. Like WHAT???? Did that seriously just happen? Yes it did. Obviously I fled the scene immediately because really? He expected that to work??? Sigh. Though this young man was over-confident and uncreative and slightly creepy, he did have a point. My mama is a good baker! And one of her specialties is zucchini bread. And because my family is awesome, our zucchini bread tends to involve chocolate. This recipe can vary from healthier cinnamon-walnut zucchini bread to chocolate chip zucchini bread, to double chocolate zucchini bread. All are delicious! 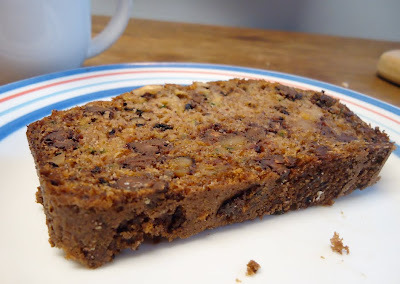 A slice of zucchini bread and a cup of coffee makes the perfect breakfast or afternoon snack. I can remember my mom grating those super-huge zucchinis you get when you leave your veggies too long on the vine into her big mixing bowl. She then proceeded to make loaves and loaves and loaves of zucchini bread. (Remember the biscotti? My mama makes things in large quantities.) Some we ate immediately, and the rest went into the freezer to save for later. I made zucchini bread this weekend for my LOTR party. 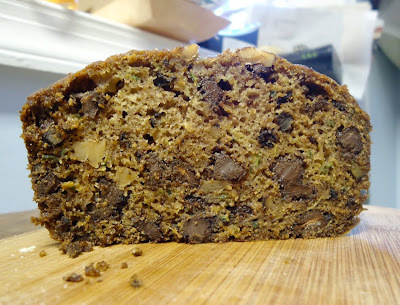 I thought that zucchini bread seemed like a hobbit-ish food because it has veggies (hobbits are farmers)…I imagine Bilbo Baggins sitting down to a slice of zucchini bread for elevensies, or perhaps afternoon tea? 1. Preheat oven to 350*. Mix the grated zucchini and salt in a drainer and let sit at least 15 minutes. Press the zucchini with a paper towel to drain out extra moisture. 2. Mix oil, eggs, and brown sugar. 3. Add dry ingredients to the wet ingredients and mix thoroughly. 4. Mix in drained zucchini, nuts, and chocolate chips if using. The batter will be thin. 5. Pour batter into two greased and floured loaf pans. Bake for 40-55 minutes, until a toothpick or sharp knife inserted in the center comes out clean. Cool for 15 minutes in the pans, then shake the loaves out and continue cooling on a baking rack. If you wanted to make this more healthy-breakfast-ish, you can always substitute apple sauce for half the oil, do all whole wheat flour, and omit the chocolate chips. Though I can't imagine why you would ever omit the chocolate chips!